Roosevelt's Diner and Bar ('Roosevelt's') is a dining destination located behind the Dorsett Residence at H exit of Outram MRT. When you turn to face the diner, you will notice their eye catching logo of teddy bear smoking a cigar. This remind me of the movie TED, that featured the naughty R rated teddy bear. Back to the food, Roosevelt's just revamped their brunch menu and we are here to give it a try. Currently brunch menu is available up to 6PM daily. We started with something light and healthy. Shiitake Sesame Salmon ($18). This salad bowl featured a healthy ingredients and super food. The plating is so attractive, made it difficult not to try it. The salmon was sous-vide, allowing it to retain the juice with moist and flaky texture. 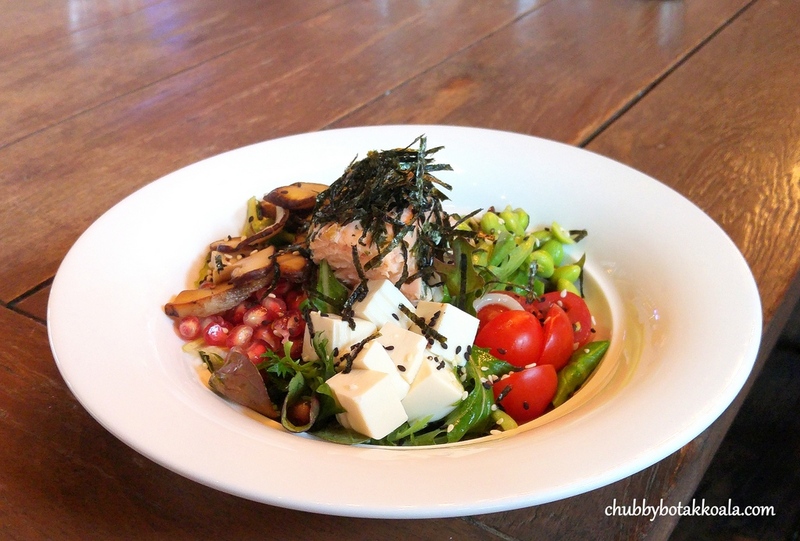 The tofu, mushroom, edamame and pomegranate contribute variety texture and flavour to the dish. While the sesame dressing bind all the ingredients and flavour together. Charred Corn Quinoa ($17). This salad bowl looks more like Mexican version of salad dish, served on the side of the taco. Ingredients are fresh and commonly found, topped with the creamy avocado and crunchy shrimp. They can be more generous with the portion of the dressing, as I find hard to coated the whole salad. Mozzarella Steak Sandwich ($16). Wholemeal artisanal bread, mozzarella, mustard and sliced chuck steak. A simple comfort food, but definitely good for any occasion. The steak is nicely done, juicy and tender, well complemented by the cheese and crisp bread. The secret ingredient here is the mustard, that give the sandwich the twang, so you won't feel overwhelmed. For those who like Big Breakfast ($28) the version here will filled you to the brim. Scrambled eggs, cherry tomato, shiitake mushrooms, chipolata sausage, bacon and spiced potatoes. Your protein and carbo served in one. The twist here is Roosevelt's use of croissant instead of white or wholemeal bread, which was fluffy and buttery. Truffle Potato Foam with Croissant ($21). A very light and fluffy egg to go with the croissant. When you scoop into the mini cast iron bowl, it is pretty much a beautiful mess. Difficult to separate the ingredients so you just allow your sensory taste to enjoy this dish. Soft, velvety, creamy, rich of flavours and buttery. Definitely a dish that you want to have for your breakfast. For something sweet, you can consider Churros Waffle ($12). Buttermilk waffle that combine a crisp texture with slight chewy feel. The spiced sugar is a bit mild for churros comparison, however the chocolate sauce and vanilla ice cream definitely make the waffle a must try dessert here. The milkshake here come in a more dessert version. We sampled Salted Caramel, Oreo Cheesecake and Strawberry Cheesecake ($12 each), it really feels like you are drinking a ice cream X Cake put inside a blender. From the dinner menu, we sampled Pan Seared Hokkaido Scallops ($21). Perfectly cooked scallops. Browned and crisp on one side, while plump and velvety on the other side. To pair scallops with a strong flavour of yuzu mustard ricotta is pretty bold move, however works out well here. Coffee here is from Liberty. So coffee lovers can rejoice. The atmosphere of Roosevelt's is modern industrial chic. Lots of natural light due to its glass window concept. One part of the restaurant wall is covered with retro wall paper, the other with neon lights, and behind the counter was the Roosevelt's logo with light bulbs. Certainly a hip place where you want to spend the afternoon. Not sure why they have a scooter there though. 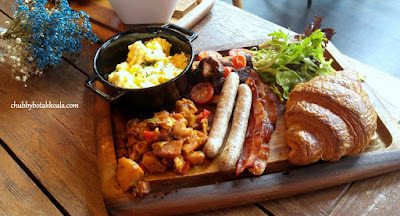 Overall, a lot of thoughts has been put into this brunch menu resulting in Creative, Fresh and Delicious food. So if you are looking for an all day brunch spot, check out Roosevelt's Diner and Bar. Cheers!! Thank you very much to Msginginly; Ying and Roosevelt's Team for the tasting invitation.